VenusLocker Ransomware is a malicious infection that was designed to take and hold your files hostage until you pay a ransom. This dangerous infection comes from the same group of threats as Razy Ransomware, Anonymous Ransomware, or R980 Ransomware, and, of course, it deserves removal. Unfortunately, you cannot eliminate this threat right away because your files are at risk, and you might lose them. If your documents, photos, and other sensitive files are not backed up, you will rely on a decryption key (or private key) to have your files recovered. Unfortunately, getting this key without paying the ransom is impossible, and the developer of this ransomware is asking a huge ransom for it. Should you pay the ransom? What other decryption options do you have? How to remove VenusLocker Ransomware? These questions are answered in this report. As soon as VenusLocker Ransomware invades the targeted operating system – and it is most likely to spread via spam email attachments – it starts encrypting your files. Unfortunately, it is done silently, without your notice, which means that it is highly unlikely that you will be able to stop this threat once it is in action. Once the malicious deed is done, this threat changes the wallpaper on your Desktop with userbg.jpg, a file that represents this message. To decrypt and recover all your files, you need to pay 100 US dollars for decryption service. 3. You will receive your private key to recover your files within one working day. For detailed information, please refer to the dialog or “ReadMe.txt” on your desktop. 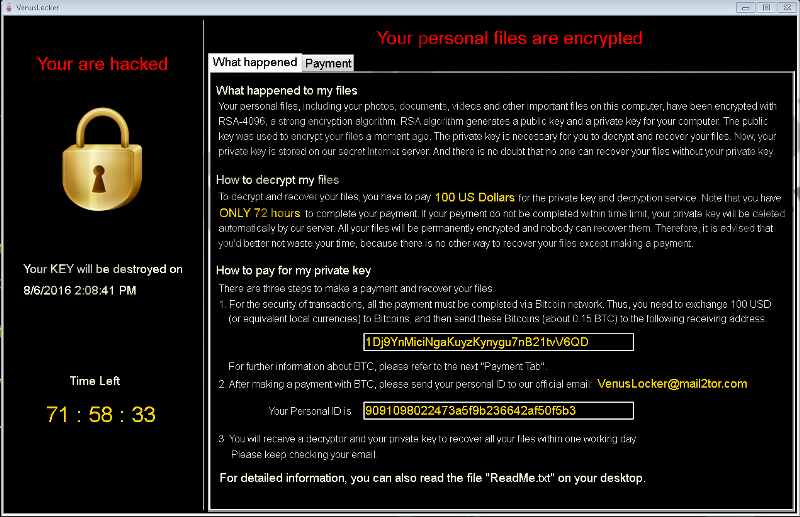 At the same time, VenusLocker Ransomware can launch an intimidating alert from its main executable file. This alert carries the same message, but it is more extensive, and it presents additional information. According to this alert, you only have 72 hours to make the transaction. After the time runs out, the private key will supposedly be deleted, which suggests that you will not be able to recover your files. This alert also includes your personal ID that you are demanded to send to the provided email. You also have a TXT file called ReadMe.txt, and it was created to force you into paying the ransom as well. Although the sum of the ransom is not incredibly big, if you compare it to the ransom payments linked to other infamous threats (e.g., NoobCrypt Ransomware that might request up to 5 Bitcoins, or nearly 3,000 USD), paying it is not what we recommend. According to our research, VenusLocker Ransomware is based on the open-source ransomware code called “EDA2.” Other infections using this code include Locked Ransomware and Russian EDA2 Ransomware. Although it is unlikely that the same group is responsible for all of these threats, all of them are very similar. Once these ransomware infections corrupt files, they attach additional extensions. In our case, you will see “.Venusf” and “.Venusp” extensions attached to your personal files. Editing these extensions will help with nothing because when files are encrypted, data is changed within them. You might find a helpful file decrypter, but, at the moment, the tools we have tested could not decrypt the files corrupted by this ransomware. As mentioned previously, paying the ransom issued by this threat is not a good idea. Cyber crooks are not reliable, and their promise to decrypt your files in return of a fee might be misleading. Hopefully, your files are backed up or you find a legitimate file decrypter instead of losing your files for good or risking your money. When it comes to the elimination of VenusLocker Ransomware, we suggest deleting this infection using an anti-malware tool. A legitimate anti-malware app will erase every single component of this malicious threat, and this is helpful to those users who cannot identify all components themselves. Moreover, this software can enable the protection that your operating system so desperately needs. If you do not implement this software, your PC will remain vulnerable. If you want to clean your PC with your own “hands,” use the guide below. Make sure you identify the main executable of this threat, and it might be the corrupted attachment you found in a spam email. Right-click and Delete the malicious executable. Enter %HOMEDRIVE%\Users into the bar at the top. Delete the file called userbg.jpg. Go the Desktop and Delete the ReadMe.txt file. Immediately scan your PC to check for leftovers. Quick & tested solution for VenusLocker Ransomware removal.